Gerald (Jerry) Traphagan was born March 25, 1950 to Gerald Elwood and Irene (Pickrel) Traphagan at St. Catherine's Hospital in McCook, NE. Jerry attended McCook Public Schools, graduating in 1968. During his childhood he participated in various sports and became a lifelong St. Louis Cardinal Baseball, University of Nebraska, hunting and fishing fan. In high school he was a drummer in the marching band and played American Legion baseball. He worked during the summers for the Burlington Northern Railroad. Jerry earned an A.A. degree from McCook community college and then transferred to Northern Colorado State University, where he earned a B.A. degree in education in 1972. He then accepted a math teaching contract with the Chadron Public Schools and later earned a M.A. degree in math and a Specialist in Education. During his 36 years in education, Jerry coached football, started the girl’s basketball program and served on many school committees. He considered all of his Chadron students “his kids” and kept in touch with many of them over the years. In high school Jerry met Kathy Kotschwar and they married in 1972 in Culbertson, NE. Two children were born to this union, Ryan Matthew and Lindsay Danielle. The Traphagans lost Kathy in 1992 in a tragic car accident. In 2001 Jerry and Mary Gould were married and lived in his version of “paradise” on Hidden Valley Road, overlooking the Nebraska landscape and sunsets. Jerry and Mary enjoyed 24 years of family, love and laughter. Their home was always his favorite place and loved welcoming family and friends to the many celebrations and gatherings. In 2006 Jerry was diagnosed with a very rare islet cell pancreatic cancer. He began treatment at the Mayo Clinic and felt fortunate to be given nearly 13 more years of life after his diagnosis. During this time he and Mary checked things off their bucket list. 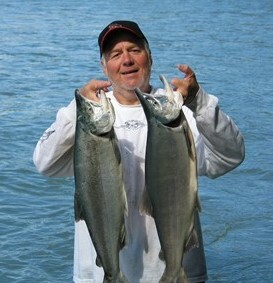 Jerry fished in Alaska every summer. Jerry is preceded in death by his mother, Irene Traphagan and his first wife Kathy. He is survived by his wife Mary of Chadron, father G. Elwood Traphagan of McCook, son Ryan of Las Vegas, daughter Lindsay, husband Glen, grandchildren Liam and Iris of Melbourne, Australia, sister Susan Yates of Yakima, WA, aunt Faye Korell of McCook, brother-in-laws Dean, Pat (Nan), Gary (Laurie) Gould, sister-in-law Katy (Rene) Tomisser, 5 nieces, 3 nephews and many cousins.. In lieu of flowers, a scholarship will be established in his memory for a Chadron High School graduate. Am memorial will also be established for Chadron Hospice and the Chadron Fire Department. Donations can be sent to the Chamberlain Chapel, PO Box 970, Chadron, NE 69337.